Sydney Lane is aware of the type of environment she wants at the next level. The rising Rivercrest (Arkansas) High senior is one of the best high jumpers in her home state, but she comes from a small town of less than 1,000 people. And so with every big high jump -- including Lane's AAU Junior Olympic Games win in Ypsilanti, Michigan -- more and more programs will take notice of her talent, especially with victories like her 5 foot, 7 inch jump on Thursday. Still, Lane, the No. 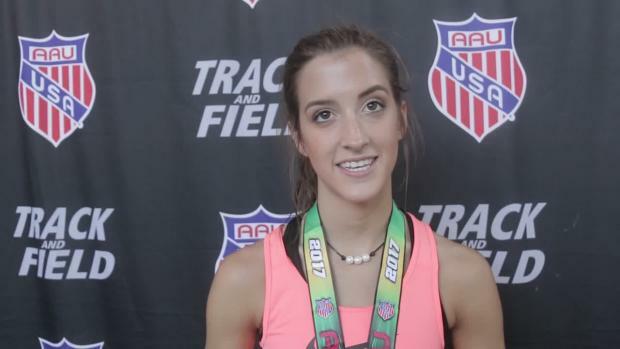 1 ranked girls high jump athlete in Arkansas, is being cautious. "I'm definitely looking for a track team that performs well as a family, that they're really close," she said. The only question is whether Lane, who is also ranked US No. 3 in the AAU age category of 17-18 girls, will want to compete at a a major Division I program like the University of Arkansas or a smaller Division I team like Arkansas State. "I'm kind of leery of going to a bigger school, because I've grown up in a really small town, so I'm looking for something smaller," she added. On Thursday at Eastern Michigan's Rynearson Stadium, Lane's run of dominance continued, though it came against national competition. She marked a height of 5-7 for the fifth time this season. With it came her first national title. "It was really exciting," she said. "I was hoping to get a better height, maybe tie my PR, maybe get a new PR. But it's really exciting to win." Next spring, Lane will hope to win her third Class 3A Championship in the event and her fourth over the indoor season. In 2016, Lane also finished third at New Balance Nationals Outdoor. "I've been to big meets before," she said. "It was kind of the same. It was an amazing experience. Just winning. That was my favorite." On TV: Available on Roku and Apple TV 4 -- download the FloSports app now. BONUS: Yearly subscribers on any of our sites get access to all premium content throughout our network. On MileSplit.com, Universal subscribers get premium access to all sites. Existing monthly subscribers can upgrade to an annual subscription in their account settings. Insight: MileSplit now offers Club Rankings, the definitive guide to the 2017 boys and girls outdoor leaders in every track and field event.